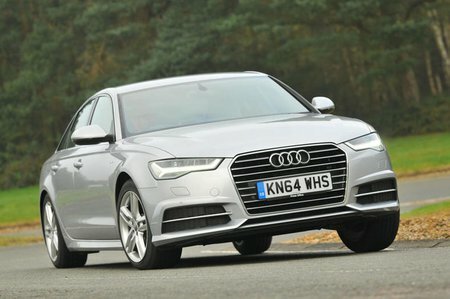 What's the used Audi A6 saloon like? The Audi A6 has always been a stylish and luxurious executive car, and this 2011 version does not buck that trend. Moreover, it substantially improves on previous models by being lighter and therefore better to drive and to ride in, it's more efficient and easier on the pocket, too. Under the sleek looks, the A6 is unusual in this class in being front-wheel drive, whereas its most obvious rivals from BMW, Mercedes-Benz and Jaguar are all rear-wheel drive. There are some who would see this as a potential sticking point, since rear-wheel-drive cars tend to be better to drive. But the A6 offers the option of four-wheel drive (called quattro) and the truth is that, in everyday motoring, even the front-wheel-drive models are safe and secure and can be driven in difficult road conditions without any qualms. It may not set your hair on fire, even with its more powerful engines under the bonnet, but the A6 has plenty of grip, great balance and noticeably good poise. Luxury executive car owners also demand that their cars are quiet, luxurious, well equipped and comfortable, and on all those points the A6 delivers. All engines are punchy and refined, and the ride is better than models of old and excellent nearly all of the time, especially so since all models benefit from adaptive damping. However, the four-wheel-drive S line models can fidget and thump occasionally at low speeds. Inside is a good driving position with plenty of adjustment and space in the back for two, although a high central tunnel restricts leg room for the middle passenger, even in the front-wheel-drive models. However, the boot is large and interior quality is exceptionally good, aided by the use of upmarket materials, clear instruments, good ergonomics and a well-equipped kit list. Every A6 comes with Audi’s impressive MMI infotainment system, which is one of our favourites, with its central screen controlled by a rotary dial between the two front seats. So, the A6 is an impressive car new and, to an even greater degree, used. Its only problem has always been the competence of its exceptional rivals in this class, but even that doesn’t stop us from recommending buying a used A6. Read on for our full lowdown.